In its form of government, Kyrgyzstan combines elements of a presidential and a parliamentary republic. Jogorqu Kenesh is the Parliament of the Kyrgyz Republic. Kyrgyzstan is one of the world's largest exporters of mercury and antimony with a huge hydropower potential. Kyrgyzstan has a two-tier banking system, with the National Bank of the Kyrgyz Republic – which monitors and licenses the activities of banks and other institutions – representing the upper tier, and 25 commercial banks and non-bank specialized financial institutions making up the lower tier. Lending services in Kyrgyzstan are also provided by credit unions. The Som is the official currency of Kyrgyzstan. Ministry of Finance (MOF) develops and implements the financial policy of Kyrgyzstan, including preparation and execution of the budget. Ministry of Justice (MOJ) provides legal and regulatory support to the State in performing its relevant functions, coordinates the legislative activities of the executive agencies, regulates the legal entities registration procedures and is responsible for protecting human and citizens’ rights and freedoms within its terms of reference as well as for arranging and conducting forensic examinations. The MOJ maintains the Universal Government Register of Legal Entities, including non-profit organizations. Ministry of Foreign Affairs (MFA) performs executive and regulatory functions in external affairs and forms the unified system of diplomatic service. The MFA is responsible for maintaining relations with international organizations, including the UN Security Council and its Committees. Besides that, the MFA coordinates the activities of the government agencies (including the State Financial Intelligence Service) for pursuing a single foreign policy in relations with foreign countries and international organizations. Ministry of Internal Affairs (MIA) is responsible for detecting, preventing, disrupting and solving criminal and administrative offences and for investigating criminal cases that are subject to investigation by the internal affairs agencies, including cases related to ML/TF. Under the current reform of the law enforcement system, the MIA’s powers related to investigation of ML cases will be delegated to the State Service for Combatting Economic Crime (SSCEC). As a result of liquidation of the State Drug Control Service under the Government of the Kyrgyz Republic (SDCS), its functions related to combating illicit drug trafficking, including investigation into this type of criminal offences, will be completely assigned to the Ministry of Internal Affairs. State Service for Combating Economic Crime under the KR Government (SSCEC) is responsible for detecting, preventing, disrupting, solving and investigating economic crimes that inflict losses upon the State and white-collar crimes in the economic and financial sphere, in compliance with the Kyrgyz legislation. Under the current reform of the law enforcement system, the powers related to investigation into ML cases are fully delegated to the SSCEC. National Security Committee (NSC) is responsible for the national security of Kyrgyzstan. For this purpose, the NSC carries out preventive and investigative measures in relation to terrorism, extremism, separatism, most dangerous forms of organized crime, corruption, smuggling and illegal trafficking in arms, narcotic drugs and precursors. State Customs Services under the KR Government (SCS) is the law enforcement agency. The SCS is responsible for enforcement of provisions of the customs legislation in respect of goods and vehicles transported through the checkpoints at the customs border of the Eurasian Economic Union (EAEU), including goods and vehicles transported across the borders of the free economic zones. Under the current reform of the law enforcement system, the SCS is not empowered to conduct investigations into customs offences, since these powers are delegated to the State Service for Combating Economic Crime (SSCEC). State Financial Intelligence Service under the KR Government (SFIS) is the designated AML/CFT agency. The SFIS is the administrative type FIU and is not authorized to conduct criminal detective and investigative operations. General Prosecutor’s Office (GPO) is responsible for supervising precise and consistent implementation of the Kyrgyz laws and regulations by local authorities, ministries, government committees, administrative bodies and other authorities, which are established under the KR Government, local administrations, public associations, officials, business entities (irrespective of the type of ownership) and individuals. The Prosecutor’s Office executes criminal prosecution and engages in litigation in court. The Prosecutors’ Office also supervises compliance with the legislation by the government agencies engaged in criminal intelligence and detective operations. Under the current reform of the law enforcement system, the prosecutorial authorities will not be empowered to conduct investigations, and the powers related to investigation into malfeasance in office will be delegated to the National Security Committee (NSC). Judicial Department under the KR Supreme Court is responsible for ensuring actual, complete and timely voluntary compliance with or enforcement of orders of courts and other agencies that came into effect under the current legislation. State Tax Service under the KR Government (STS) represents the unified system of tax authorities that perform the executive functions related to monitoring compliance with the tax legislation, correct calculation and timely collection of taxes, assisting taxpayers in fulfillment of their tax obligations as required by the Kyrgyz legislation, registration of individual entrepreneurs, and also exercises government regulation and supervision of production and (or) sales of ethyl alcohol and alcohol-containing products. National Bank of the Kyrgyz Republic (NBKR) is the Central Bank of Kyrgyzstan. According to the Kyrgyz legislation, the main function of the NBKR is to maintain the purchasing capacity of the national currency and to ensure effectiveness, safety and reliability of the banking system and payment system of the country for facilitating long-term economic growth of Kyrgyzstan. The National Bank regulates and supervises the activities of banks and financial and credit institutions that are licensed by the NBKR. Financial Market Supervisory and Regulatory Service (GOSFINNADZOR) issues licenses to perform professional activities in the non-bank financial market and audit functions as required by the KR Law on Designated Financial Market Supervisory and Regulatory Authority and the KR legislation pertaining to regulation of the non-bank financial market, grants licenses and conducts audits and also suspends and renews licenses in the situations provided for in the Kyrgyz legislation. The GOSFINNADZOR also grants permits to operate in the capacity of a self-regulatory body in compliance with the requirements set forth in the KR legislation that regulates non-bank financial market and audit activities. Precious Metals Department under the KR Ministry of Finance (PMD) prepares, in the established manner, expert judgments required for obtaining license to export and import precious metals and precious stones. The Department also performs assay supervision and government monitoring of production, use, registration, storage and sales of precious metals and stones in the domestic and international markets and their release from the national reserve. Besides that, the Department ensures compliance with the Kyrgyz AML/CFT legislation by entities engaged in transaction with precious metals and precious stones. State Information Technologies and Communications Committee (SIT&CC) is the government executive agency responsible for regulation of electrical and postal communications (postal money transfers), including the use of the radio frequency spectrum and provision of the electrical and postal communication services on a competitive basis. The SIT&CC mission is to ensure effective management of the radio frequency spectrum, facilitate the development of communication networks and systems and protect the legitimate interests of the citizens and other users of the communication services. Casino – According to KR Law No.191 on Prohibition of Gambling Business in the Kyrgyz Republic of November 1, 2011 operation of casinos is banned in the territory of Kyrgyzstan. Real estate agents - Individuals (individual entrepreneurs) or legal entities (real estate firms) engaged in real estate business - professional business activities that are performed on a permanent basis and involve provision to other persons of fee-based services (specified in the KR Law on Real Estate Business) related to transactions with real estate property and ownership title thereto in compliance with the KR legislation. - provision of services related to making proper and safe payments under the real estate sale and purchase contracts, except for services that require banking license. Dealers in precious metals and precious stones – These business entities are involved in one or more types of the following activities: production, purchase and sales, processing of recoverable materials, purchase of alluvial gold and gold-containing concentrates. Most entities are engaged in purchase and sale of precious metals, precious stones and jewellery made of them (397 entities in 2016). According to Article 2 of the AML/CFT Law the reporting entities include persons engaged in transactions (deals) with precious metals, precious stones, jewellery made of them and their scrap when they carry out any cash transactions with customers. Advocates – In Kyrgyzstan, the activities of an advocate (barrister) involve provision, on a professional basis, of competent legal assistance by persons, licensed (in a manner established in the legislation) to act in the capacity of advocates, to physical and legal persons, government agencies, local authorities and defendants (if participation of an advocate in the capacity of a defence counsellor in court proceedings is mandatory) for protection and safeguarding their rights, freedoms and legitimate interests and access to justice. Advocates may practice the law both independently and in the capacity of employees/partners of law firms incorporated in forms specified in the Kyrgyz legislation. Legal assistance provided by advocates in course of their legal practice is considered non-commercial (non-profit) activity. Thus, the activities of advocates primarily involve preparation of cases for court hearings and participation in court proceedings. Advocates do not carry out any of the activities covered by the FATF Recommendations which relate to DNFBPs. Notaries – Notaries conduct notary actions certifying indisputable facts, events of legal significance, and authenticating legal documents for their use for legal and other purposes. Law on Notaries allows notaries to accept monetary and securities deposits for safekeeping. Notaries prepare real estate transactions for their customers. Independent lawyers – In Kyrgyzstan, independent lawyers are the private-practice lawyers, whose activities include the provision of a wide range of consultative and other legal services which are not connected with any types of court proceedings, including preparation of real estate transactions for their customers. The activities of independent lawyers are not subject to licensing and may be conducted by any legal person or individual entrepreneur. There is no information on the number of lawyers and law firms operating in Kyrgyzstan. Independent accountants – Are not involved in activities covered by the requirements set out in the FATF Recommendations. There is no information on the number of private-practice accountants operating in Kyrgyzstan. Trust and company service provides – There is no separate professional category of individual and/or corporate trust and company service providers in Kyrgyzstan, as it is understood by the FATF Recommendations. In Kyrgyzstan, the self-regulatory body of real estate agents is the Public Association of Kyrgyz Real Estate Agents that unites real estate agents and professional real estate market participants. This Association operates in compliance with the KR Law of Real Estate Business in the Kyrgyz Republic. The professional self-regulatory association of advocates is the Kyrgyz National Bar Association, membership in which is mandatory for advocates (barristers) of the Kyrgyz Republic. The Notary Chamber, being the voluntary public association of independent notaries, represents and protects the rights of private notaries. The Public Association of Kyrgyz Accountants and Auditors is the non-profit organization uniting the Kyrgyz certified accountants and auditors on a voluntary basis. The Law on Combating Money Laundering and Terrorism Financing (AML) went into effect in Kyrgyzstan on November 8, 2006. Over the past two years, Kyrgyzstan has made major amendments to its AML/CFT Law aimed at implementing the EAG's recommendations and bringing it in line with international standards. In June 2018, the Kyrgyz Parliament passed the revised version of the AML/CFT Law after three readings. Kyrgyzstan's financial intelligence unit (FIU), which reports to the Kyrgyz Government, has been operating since September 2005. The State Financial Intelligence Service under the Government of the Kyrgyz Republic is an administrative-type financial intelligence unit outside the country's law enforcement or judicial system. The FIU's key objective is to protect the integrity and stability of the Kyrgyz financial system. Acting in line with the AML/CFT Law and its regulations, the FIU has entered into cooperation and information sharing agreements with the country's National Bank, State Service for Combating Economic Crimes, Interior Ministry, Prosecutor General's Office and other agencies. The Kyrgyz FIU's cooperation with its foreign counterparts and international organizations constitutes a major part of its activities. The State Financial Intelligence Service has entered into agreements and memoranda of cooperation and mutual support with a number of foreign FIUs. The Kyrgyz Republic’s FIU has been a member of the Egmont Group since 2009. The State Financial Intelligence Service of the Kyrgyz Republic is headed by a chairman, who is appointed and discharged by the Prime Minister of the Kyrgyz Republic. Since July 2018, the position of SFIS chairman has been occupied by Gulamzhan S. Anarbaev. Education: graduated from the Kyrgyz State National University's Department of Law in 1997 and received a master's degree in management from the Academy of Management under the President of the Kyrgyz Republic in 2004. 1990-2005 – a law enforcement officer. 2006-2007 – head of department at the Osh Financial Police Service. 2007-2008 – head of the Osh Financial Police Directorate. Oct. 2007-Jan. 2010 – head of directorate at the Osh Financial Police Service. Jan. 2010-May 2010 – deputy head of the State Financial Police Service's Bishkek Directorate. May 2010-Aug. 2010 – head of the State Financial Police Service's Financial and Logistic Support Directorate. Feb. 2011-Feb. 2012 – deputy head of the Interior Ministry's Directorate for Combating Organized Crime and Corruption for the Osh, Jalal-Abad and Batken Regions and the city of Osh. 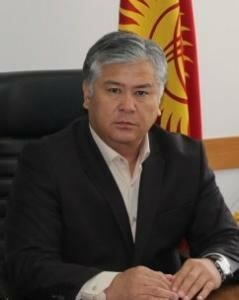 2012-2015 – first deputy chairman of the State Drug Control Service under the Government of the Kyrgyz Republic. Dec. 2016-Apr. 2018 – chairman of the State Material Reserves Fund under the Government of the Kyrgyz Republic. July 2018 until present – chairman of the State Financial Intelligence Service under the Government of the Kyrgyz Republic. On October 6, 2004 at the founding conference of the EAG in Moscow, the Kyrgyz Republic became a member of the Eurasian group. In 2007 the Kyrgyz Republic was the first EAG member country to pass the mutual evaluationon the compliance of its national AML/CFT system with international standards. In 2016-2018, Kyrgyzstan again became the first EAG country to undergo a second round of mutual evaluations. In July 2008 Kyrgyzstan hosted the 8th Plenary meeting of the EAG . In May 2017 the 26th EAG Plenary were held in Bishkek.